The Blue Monkey has always been one of my favorite places to both party with friends and to dine at. As a restaurant/bar, it serves high quality food that is just below the standards of four and five star restaurants, offering menu items ranging from modest appetizers like its homemade Monkey Chips to sandwiches and entrées such as its hand cut beef filet. Of course, most of the Monkey's regulars go there for the alcohol, and it has a full service bar that more than adequately meets their needs. However, I'm more of a foodie, so whenever I go there, I definitely get my grub on. The Blue Monkey has a lot of menu items that I can easily comment on, but I'll focus on three of my favorites: the Hot Wing Rolls, the Prime Rib and its "little brother," the Prime Rib Poboy sandwich. 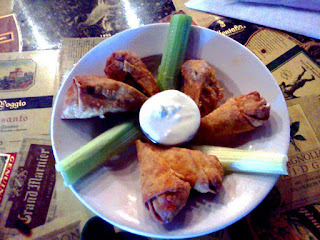 The Hot Wing Rolls are very unique in that it takes the best qualities of both the egg roll and hot wings, allowing a diner to get the taste of chicken and hot sauce without getting messy fingers. Whoever came up with this concept is a genius, for the Hot Wing Rolls, which come with celery and either Ranch or Blue Cheese dressing for dipping, work great as both an appetizer and a nice, light late night snack. As far as it being a late night snack, it is especially useful for those who are a little tried after being up most of the night, with the hot sauce providing the "jolt" needed reawaken the senses. The Prime Rib entrée and its poboy brother primarily consists of slow roasted prime beef that is cooked to order. In all the times that I had either one, my experience has been of the meat being well tenderized and seasoned with a good amount of fat, which I sometimes indulge in against my doctor's wishes. Accompanied with Tiger (a mixture of horseradish and mayonnaise) and au jus dipping sauces, the Prime Rib is by far The Blue Monkey's best dish. Depending on which version is ordered, the prime rib comes with either one side for the poboy, or a side and a salad for the entrée. 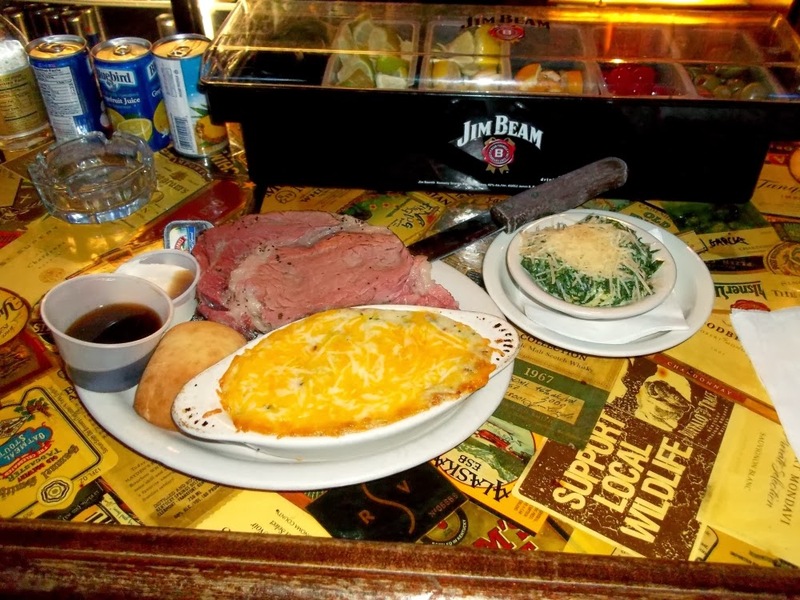 When I get the entrée, I usually disregard the salad and get two sides, which are the Twice Baked Potato and creamed spinach. As far as Prime Rib is concerned, The Blue Monkey can hold its own with some of the better steakhouses in Memphis, including Texas de Brazil. Although no one can go wrong in ordering any sandwich or entrée on the Monkey's menu, the Prime Rib definitely stands out as its best item, in my opinion. In summary, The Blue Monkey serves some of finest food that a person can find in a restaurant/bar in Memphis. The "Monkey" has two locations, with one in Midtown serving more of a working-class clientele and a Downtown restaurant that caters to the upper-class residents who live nearby. By the way, on Sundays both locations serve brunch, which is also great. In all, The Blue Monkey is fine dining establishment that I highly recommend.